Section 6.0. Introduction to Operational Amplifiers. Understand Concept of the Ideal Amplifier and the Need for Integrated Circuits. Section 6.1 Op Amp Inputs. •Typical op amp input requirements. • Open Loop Mode, The Schmitt Trigger. • Hysteresis & Positive Feedback. • The ideal op amp, NFB, Op amp rules. • Inverting & non-inverting amplifiers. Section 6.4 Op Amp Characteristics. • Power supplies, Open loop voltage gain. • Large signal voltage gain, Gain bandwidth product. 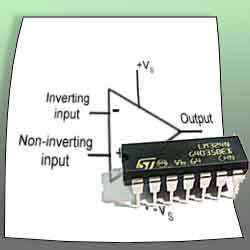 • Input offset current, Maximum differential input. Section 6.5 Op Amp Packages. • Op amp pin out examples. Section 6.6 Op Amp Circuits. • Voltage follower, Differential amplifier. Section 6.7 Op Amps Quiz. • Test your knowledge & understanding of op amps. In amplifier modules 1 to 5 voltage and power amplifiers are described in some detail so that the circuit elements that go into making an amplifier can be understood. Each of these circuit elements, such as negative and positive feedback, impedance, linearity, gain and efficiency are used with the aim of improving the amplifier’s performance towards the goal of making the ideal amplifier. The bad news is that the ideal amplifier does not exist, but the good news is that the op amp does! • Have an infinitely wide bandwidth. • Have an infinitely high gain available that can be easily controlled. • Be ideally linear, with no distortion. • Generate no noise (have an infinitely high signal to noise ratio). • Be easily convertible to perform different amplifier functions. All of the above is what the op-amp does, or at least comes pretty close to. Amplifiers with gain controlled by negative feedback were first thought of in the 1930s as a way of creating amplifiers for the telephone system that could have a controllable and reliable gain, but became operational amplifiers when they were adopted by designers of analogue computers, because of their ability to perform accurate mathematical operations, such as adding, subtracting, integration and differentiation. Operational amplifiers can still be built from discrete components but with the introduction of silicon planar technologies and integrated circuits their performance has improved and both size and cost have reduced dramatically. Although computing, for which op amps were originally designed, has practically all moved from analogue circuitry to digital electronics, the op amp has become so useful in so many circuits that deal with real (analogue) quantities such as sound, light, heat and motion, that the op amp is now a widely varied and indispensable part of electronics equipment.